Defense analysts see unmanned weaponry as the future of warfare, but critics question oversight. ABOARD USS GEORGE H.W. BUSH – A drone the size of a fighter jet took off from the deck of an American aircraft carrier for the first time Tuesday in a test flight that could eventually open the way for the U.S. to launch unmanned aircraft from just about any place in the world. The move to expand the capabilities of the nation’s drones comes amid growing criticism of America’s use of Predators and Reapers to gather intelligence and carry out lethal missile attacks against terrorists in Iraq, Afghanistan, Pakistan and Yemen. Still, defense analysts say drones are the future of warfare. The new Joint Strike Fighter jet “might be the last manned fighter the U.S. ever builds. They’re so expensive, they’re so complex, and you put a human at risk every time it takes off from a carrier,” said James Lewis, senior fellow at the Center for Strategic and International Studies in Washington. 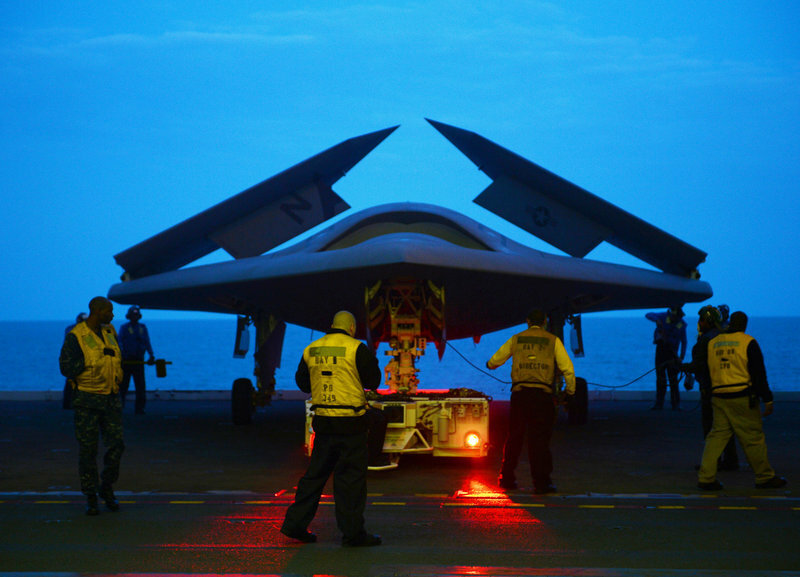 While the X-47B isn’t intended for operational use, it will help Navy officials develop future carrier-based drones. Those drones could begin operating by 2020, according to Rear Adm. Mat Winter, the Navy’s program executive officer for unmanned aviation and strike weapons. During Tuesday’s flight, the X-47B used a steam catapult to launch, just as traditional Navy warplanes do. The unarmed aircraft then made two low approaches toward the aircraft carrier as it if was going to land, before being waved off and returning to a higher altitude. The jet then landed at Naval Air Station Patuxent River in Maryland. The next critical test for the tailless plane will come this summer, when it attempts to land on a moving aircraft carrier, one of the most difficult tasks for Navy pilots. The group Human Rights Watch said it is troubled by what it described as a trend toward the development of fully autonomous weapons that can choose and fire upon targets with no human intervention. “We’re saying you must have meaningful human control over key battlefield decisions of who lives and who dies. That should not be left up to the weapons system itself,” said Steve Goose, director of the arms division at Human Rights Watch. Developed by Northrop Grumman under a 2007 contract at a cost of $1.4 billion, the X-47B is capable of carrying weapons. The X-47B can reach an altitude of more than 40,000 feet and has a range of more than 2,100 nautical miles.